It's been a pretty bleak week, so far, weather-wise. Big storms were predicted for Monday and Tuesday and, while we were spared anything too nasty, there has been a lot of heavy rain and some fair gusts of wind (there was also a rumour of snow on the Stirling Range but I think it was a case of "blink and you miss it"). 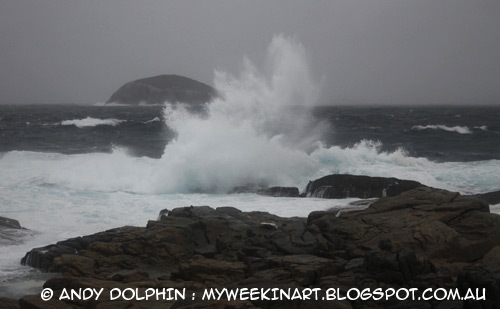 I'd hoped to go painting at Torndirrup on Monday afternoon but it was a wash-out and, along with the non-stop rain, it was far too windy to risk wandering around out there. I didn't even make the journey to see how things were looking. I did manage to get out there yesterday afternoon (Wednesday), despite continuing rain, to witness the after-effects of the storms. I hung around taking photos and video for about 20 minutes but when I wasn't getting rained on, I was getting showered with salt spray! The sea was definitely pounding, but there was no chance any painting was going to happen. The photo above tells the story - it was amazing and miserable at the same time. 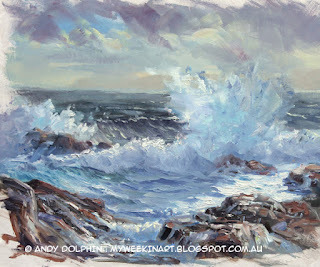 Here's the painting I did on Sunday, a very different day, as seen in my previous plein air seascape article. I used a fairly limited palette of ultramarine, cerulean, permanent crimson, burnt sienna and cad yellow light. I wanted purplish shadows to complement the yellow light and the ultramarine and crimson delivered this. I needed the cerulean to capture the very clean green-blue in the foreground wave and in the splash - this colour was very evident during this session. Burnt sienna was on the palette as a time saver, so I could lay in some quick darks without messing around with mixing tertiary colours (ultramarine, crimson and yellow). There's quite a bit to work work from here for a larger painting. I'm hoping to get back there tomorrow and see what else this spot can teach me. Depending on conditions, and emotions, I might focus on the foreground rocks and see if I can tame them.